We’re gearing up for the first selection committee meeting for the 2019 Rudy Bruner Award for Urban Excellence (RBA). To sift through the scores of submissions and whittle them down to five finalists, we assembled a multidisciplinary group of people who understand urban development, including the challenges cities face and strategies that make great urban places. Each six-member RBA selection committee includes a mayor and a participant from a prior award winning project along with other experts in design and planning, development and financing, and community engagement. Adrian Benepe senior vice president and director of National Programs at the Trust for Public Land, a national expert on the nexus of the public, private, and non-profit sectors in public space development. Brenda M. Breaux, executive director for the New Orleans Redevelopment Authority, a leader in affordable housing, commercial revitalization, land stewardship, and green infrastructure development, and partner in the 2017 Silver Medalist Iberville Offsite Rehabs I & II. Carol Coletta, president and CEO of the Memphis River Parks Partnership and senior fellow in the Kresge Foundation’s American Cities Practice, where she leads a collaboration to Reimagine the Civic Commons in five cities. Marc Norman, founder of the consulting firm Ideas and Action and associate professor of practice at University of Michigan Taubman School of Architecture and Urban Planning, specializing in community development and finance in the US and abroad. Carol Ross-Barney, FAIA, founder of Ross Barney Architects, an award-winning designer in the vanguard of civic space design. Her work includes the Chicago Riverwalk, a 2017 RBA Silver Medalist. Libby Schaaf, mayor of Oakland, California, one of America’s most diverse and progressive cities and home to three previous RBA winners. 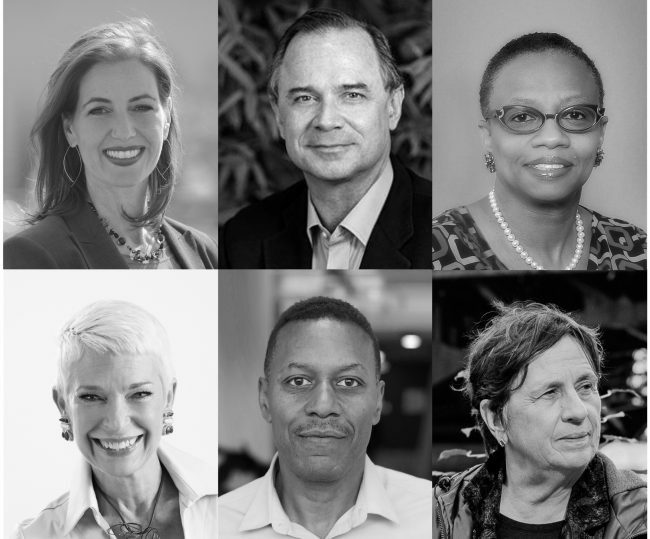 Clockwise from top left: Libby Schaaf, Adrian Benepe, Brenda Breaux, Carol Ross Barney, Marc Norman, Carol Coletta. After the committee selects the finalists, RBA staff will conduct site visits to each finalist to gather additional information. We’ll share our findings with the committee when we reconvene in June in Oakland, CA, to determine the Gold Medalist. Stay tuned for our announcement of the finalists the week of February 11 and posts about our site visits in coming months.